Of the many stubborn smartphone apps that users refuse to part with, there is Google Now for Android, Siri for Apple and now Microsoft’s Cortana. Cortana is still in the beta stage and Microsoft is not letting the AI run wild just yet. So, they take the app to the backroom and overwhelm her with numerous voice samples. But not before they show off, that’s what the Build conference is for. Cortana’s origins lay in Halo, a Microsoft videogame franchise. As a personal digital assistant, the app has a synthesized female-sounding voice. Microsoft has gone to great lengths to create the AI even interviewing live personal assistant (all of them ladies) to find out what makes them feel good at work. The personal digital assistant is powered by Bing. “So she understands the entire internet. You could say she understands everything about the world,” says Joe Belfiore, corporate VP of Microsoft’s operating systems group, in his keynote speech. The AI will now provide search functions on Windows Phone and will also serve to update your calendar. Ask Cortana a good number of questions and she begins predicting your behavior. This includes scanning your phone email if given permission. What the AI learns through this interactions is stored on an editable notebook. Customizations to this settings gives the user a personalized experience with Cortana. 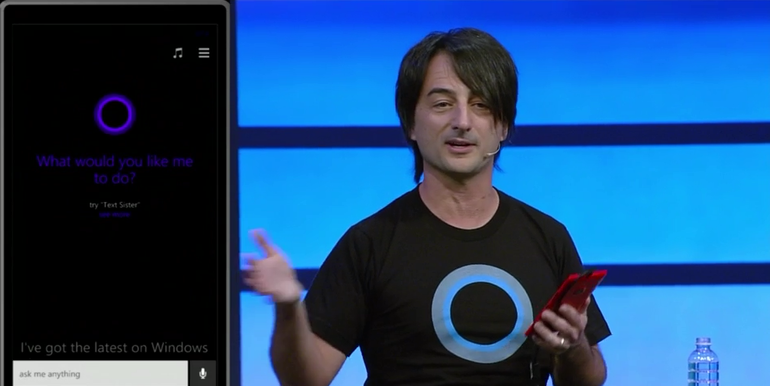 Several of Cortana’s features were showcased during the keynote but the AI had to express its sturbboness at some point and this was when Belfiore asked for temperature conversion from Celsius to Kelvin. Cortana refused to do this repeatedly. Maybe the final release will have none of this troubles. According to Belfiore, the AI is being trained in sports trivia the better to answer your sports questions. Away from the more interesting part in the Windows Phone refresh, WP 8.1 brings a lot of goodies for enterprise users. This will include S/MIME encrypted email and support for enterprise VPNs. The OS will be available to registered Windows and Windows App Studio developers starting this month, no exact date is mentioned however. Windows 8.1 devices go on sale by early May. Microsoft says its working with OEM’s for the roll out of Windows Phone updates to other devices which should be in the next few months.